Frog on Leaf with Holes Cameos Set, 2 pieces. Hand carved, artist signed, 23mm/23 mm trapezoids sardonyx shell cameo. 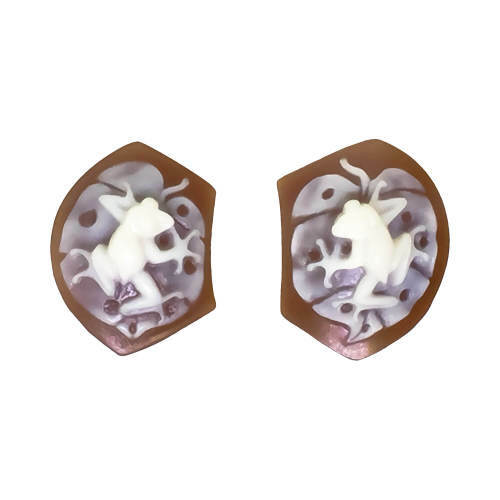 Frog on Leaf with Holes Cameo 2 pc Set. Hand carved, artist signed orignals, 23mm/23 mm trapezoids, sardonyx shell cameo. Registry numbers 1369/1383. This 2 pc cameo set has very good color contrast, and high relief. It is not always easy to get an exact match, even from the same shell.